We had another great ride in Litchfield last week - Litchfield really has an abundance of great back roads. Many thanks to George for leading and marking the route. 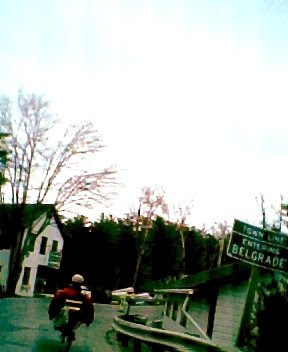 This week Memorial Day weekend arrives earlier than usual, and we will revisit a popular ride around the Belgrade Lakes. If we don't see you then, have a safe and pleasant holiday weekend. "Great Pond Go 'Round" - a tour around Great Pond through Belgrade, Rome, and Smithfield. START: 9:30 A.M., at the Belgrade Community Center on Rt. 27, a half mile south of the Village of Belgrade Lakes, on the left (southbound) next to the Great Pond Marina. Park in the community center parking lot nearest the street (just as you turn in). DISTANCE: 23 or 30 miles, with a short option of 15 miles. TERRAIN: rolling to moderately hilly. HIGHLIGHTS: views of the Belgrade Lakes, some roller coaster hills, Castle Island, and Blueberry Hill.